Roasted butternut squash fries are sweeter and healthier than traditional fries. Cut "fries" in uniform size for even cooking. 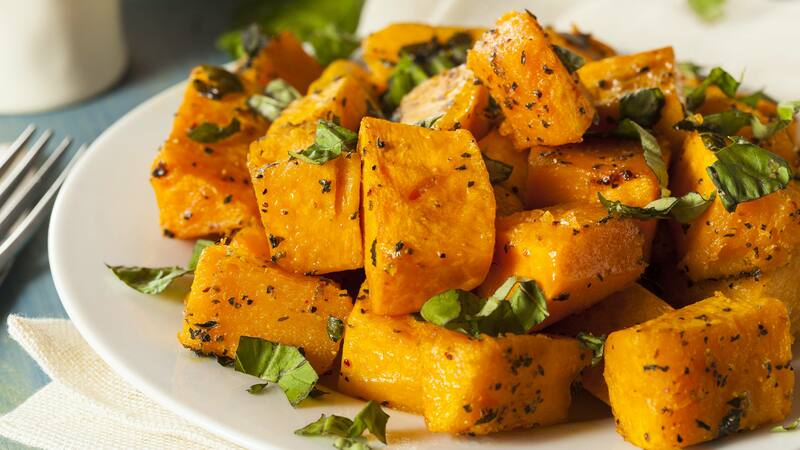 This recipe also works well with sweet potatoes or acorn squash. Each week, one of the more than 100 video recipes from the Mayo Clinic Healthy Living Program is featured on the Mayo Clinic News Network — just in time for you to try over the weekend. You also can have the recipes delivered via the Mayo Clinic App. These recipes are created by the executive wellness chef and registered dietitians at the Mayo Clinic Healthy Living Program. Find more recipes and other healthy living insights on the Mayo Clinic App. Watch: Making roasted butternut squash fries. Heat oven to 425 F. Lightly coat a baking sheet with nonstick cooking spray. Peel skin from butternut squash and cut into even sticks, about ½ inch wide and 3 inches long. In a medium bowl, combine the squash, oil, thyme, rosemary, and salt; mix until the squash is evenly coated. Spread onto the baking sheet and roast for 10 minutes. Remove the baking sheet from the oven and shake to loosen the squash. Place back in the oven and continue to roast for another 5 to 10 minutes until golden brown. Nutritional information per 2 tablespoons: 62 calories; 2 g total fat; 0 g saturated fat; 0 g transfat; 2 g monounsaturated fat; 0 mg cholesterol; 168 mg sodium; 11 g total carbohydrate; 3 g dietary fiber; 2 g total sugars; 1 g protein.